With seven of us either working in the country long term or travelling around the world the opportunity of having a large trip to New Zealand seemed too good to miss. With an additional three flying in boats and more equipment for the tourers we were off and running. After the 24 hour flight and the usual airport hire car hassles we finally got one without a roofrack (queue mats and straps through the doors) and headed off to Lake Taupo for the night. A quick morning inspection of a low Huka Falls forced us to leave in a hurry as it was very tempting. Probably 2 backloops on the run-in but then you have 100 yards to roll up before the drop with the line wide and unobstructed(ish). Went to play at Fuljames instead, water was volcanically heated and so playing was possible without thermals or cag. The next morning we visited the Okere Falls section on the Kaituna but the water was so low that we could only run the bottom bit. Marco got an introduction to grade III boating, backlooped and multiple rolls in the first drop. A quick grokel around Rotoroa and some volcanic mud pools followed before returning to Auckland to drop off the hire car and busing to Wellington. After a couple of days relaxing with Wellington semi-locals of Clive, Helen, Gary, Sarah and Toony we got a ferry to south island. Seven people, 6 boats and 1 car was a bit of a squeeze but we eventually made it to `Mecca Murchison' in one piece. Fay and Mat met us that evening and we ran several fun sections in the area. Lots of tail squirting (whoopies to the locals) as pretty much everything was high volume and gorgy with some interesting whirlpool generating eddy lines. Highlights were a massive surfing session at O'Sullivans rapid on the Buller and some really BIG WAVES. Pretty much all this stuff was big water grade III and loads of fun if you could tell the difference between a wave and a pourover (tee hee). Heading south we went to Hokitika to run the Hokatika and the Whitcombe. Both were helicopter fly-ins, 25 quid a head. 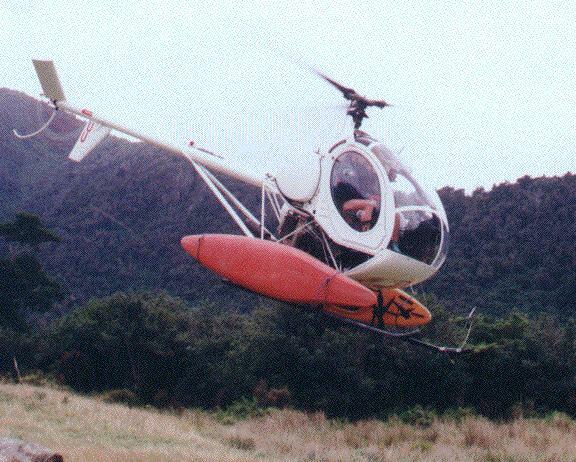 All 8 paddlers flew into the Hokitika in pairs in a very small helicopter. Great views of the gorge as we went up (after rebuilding the road to the helicopter pick-up point). Loud crys of `that didn't look too bad' once we were at the top. Hmm. At the top of the crux bit both Gary and Fay hit eddies after rolling out of a hole. The next bit was several hundred yards long, Fay missed the move to the lead-in eddy and despite yells of ``right, right'' clipped a large hole and got trashed. A big penalty for a small mistake. Adrian and I caught the boat around a km later and Fay had a nasty swim. Reforming the rest of the paddle was relatively straightforward. Next day Clive, Adrian, Mat and myself plucked up courage for the Whitcombe which we already knew was a foot up on normal levels, perhaps a third of the way to brown. The guide had it up a grade on the previous day and twice as far. Flying-in again, this time the holes were obvious. There were very few comments at the top, the previous day we hadn't seen any. 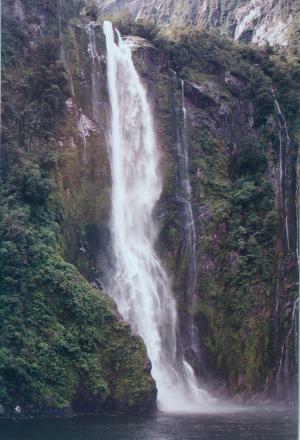 The crux of the run is Colliers gorge, 160feet/mile and around 40cumecs. Half way down none of us could spit, spending 15 minutes trying to eat a mars bar. There are some beautiful drops here, lovely curling wave lines launching you over holes with blind run-ins, technical boat handling and lots and lots of power. 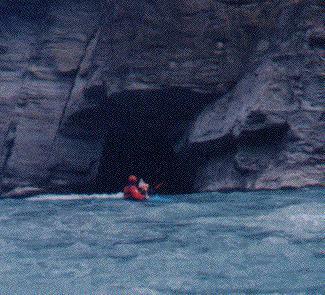 We had one short portage around a drop that nearly went but none of us fancied the hole in a Kendo. I'd rate this run as `engaging', only the second river I have in that category, a real beauty. More grokelling followed with a trip to some relaxing hot springs and visits to the Franz-Josef and Fox glaciers before the Wellington contingent left, leaving myself, Mat, Fay, Adrian and Marco to continue down the south coast. We went to Queenstown, the outdoor sports capitol of New Zealand, spending a great day running the Shotover, 20km of playing followed by some fun rapids and a 100m long tunnel. 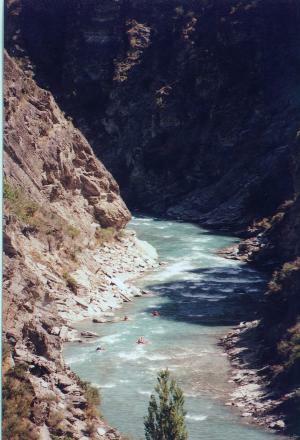 Yet more big water on the Kawarau, yet more great playing. Heading further south we spent a day bimbeling around Milford sound, including a boat trip through the fjord to see the seals and penguins. Back inland we ran the Hollyford, the upper bit was like the Upper Dart, tight and technical. The lower section took us 5 hours, gradient probably over 5 percent in the gorge, continuous technical drops with trees and everything thrown in. The guide has `around a dozen class IV+ to V drops', which is about right. Walked out to the road at the top of the third gorge as it looked horrid (Guidebook seems out here, the second gorge was straightforward and all went). Still, a fun run and not as committing as the Whitcombe. Driving down to the south coast we went to Curio Bay to surf with around 50 small (4 feet ish) dolphins. 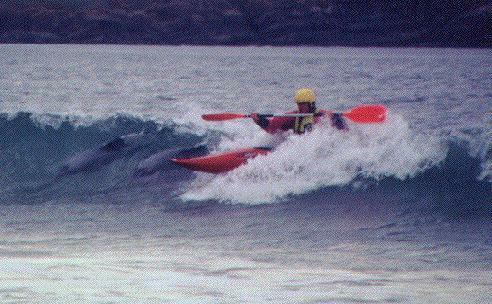 Spent all day playing with them in the small surf, decided that dolphins surf like kayakers (i.e. many on a wave) not like boardies. None of them shouted `my wave' either or hogged the shoulder. Had to drag Fay off to cries of `dolphins'. Back to Dunedin that night, a 4am night out on the town during which much beer was consumed and then a 48 hour journey home. Realistically New Zealand deserves its reputation as an outdoor sports mecca. The locals are great and don't moan all the time or apply petty rules for no reason, the air is clear and the countryside stunning and empty of people. Paddling wise you can perhaps do better as there seems to be a gap between wonderful grade III play sections and helicopter hair sections, both Norway and California provide a more complete range of boating. Still, if you like superb playing or hair boating then New Zealand is a destination to add to the list. 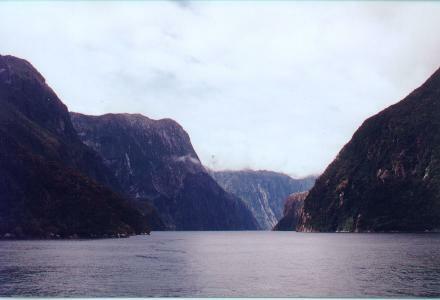 New Zealand is good for paddling because it rains A LOT, up to 750cm a year. This means that you should expect the weather to be changeable with several days of hard rain. At about the same latitude as southern France the climate is mild in February, adding 6 months and equating to the alps will give you some idea but the biggest surprise is the changeability and localness of much of the weather. Go over the next ridge and you could be in bright sunshine. Water temperatures vary a lot, some rivers are literally glacial melt with large chuncks of ice floating past whilst others are volcanically heated to bath temperature. The locals tend towards longboats, both bandits and overflows seemed popular. We had eight boats, 5 kendos, a fly, a supersport and a topo. We took drycags and full thermals which were all used, albeit rarely at times. The season seems to be November to March but is really all year, stopping due to cold and the distractions of plentiful alternative winter sports. Boat hire is relatively cheap if you don't want to bother flying in your own, around 20NZ$ a day seemed to be the going rate for a boat, blade, bouyancy aid type deal. Hire companies are listed in the guidebook, both the one in Wellington and Mick Hopkinson's Murchison based operation were friendly and helpful. 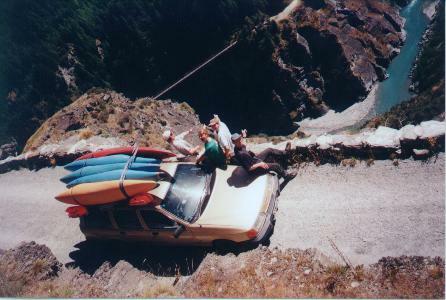 As far as hire cars go you can get some great deals from the smaller companies but roofracks were a little more difficult to obtain. We were paying 75NZ$ a day for a 1.6 4-door but that should be viewed as absolute top whack. Booking a car in advance may be an idea in the high season (February) as there were virtually no cars around for us. Three of us flew with Korean airlines from London via Soeul to Auckland for around 700UKP. They carried our boats for nothing. On the way back we flew from Dunedin to Auckland first with Air New Zealand to save the return travel time. Internal flights are cheap, around 100US$ each. The others are variously travelling around the world or working long term in New Zealand. 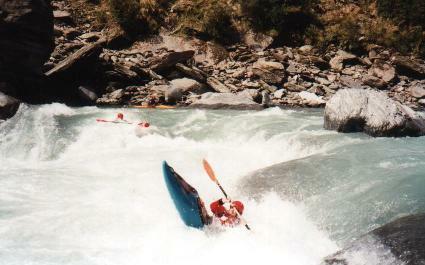 New Zealand Whitewater, Graham Charles 1996, Craig Potton Publishing, ISBN 0 908802 36 6. This is an excellent guidebook with some very nice colour pictures to boot. Please note that the grading is real, not the usual guidebook practice of overgrading for insurance or rafting reasons which might take a bit of getting used to. Sometimes the description is a little harsh and flaky but in general this is a solid guidebook, our biggest problem seemed to be equating our flow guesses to those in the guidebook and those made by locals. We were consistently lower, but then what's 100 cumecs between friends ?